#950 Skipper debuted in 1964 . She is Barbie's little sister. 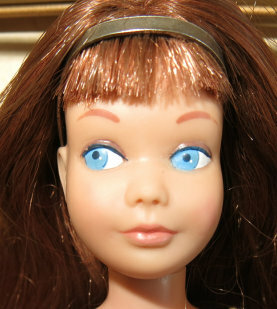 She has blue eyes, coral lips, and comes in a choice of hair colors; blonde, brunette or titian hair. She wears a one-piece red and white swim suit and stands 9 1/4 inches tall. The box included skipper in her one-piece red and white swim-suit, red flat shoes, brass headband, white plastic brush & comb, black or gold wire stand, and booklet. Note: There's also color magic hair which is a rich titian/brunette two-toned color with a brown scalp that matches the hair color. Many of Skippers fashions were a small version of Barbie's fashions. Rare two-tone "color magic" hair. It looks like a modern day weave! It is brunette hair with red highlights or brunette with blonde tone highlights. Both have a brunette scalp. The word "japan" on the bottom of an early straight-leg Skipper's foot. It is written from toe to heel. Some believe these were early sample dolls.